The Mahabharata is a giant epic poem dating back more than two millennia. It is an incredibly complex story with many different characters that tells about the fight over the throne of Hastinapura by two branches of a royal family: the five Pandava brothers and their hundred cousins, the Kauravas, headed by Duryodhana. Their animosity starts out as a fierce sibling rivalry. It is strengthened by the preferential treatment of Arjuna, the middle one of the Pandavas, by the archery teachers of the young princes. It ends in an eighteen day long war in which all the Kauravas are killed. Interwoven with the main narrative are several side-stories and philosophical discourses. Traditionally, the authorship of the Mahabharata is attributed to Vyasa. However, the epic is told all over India in many different languages, interpretations and artistic forms. Kattaikkuttu’s all-night Mahabharata performances in Tamil are an example of such a regional variant. They use different episodes from the Mahabharata, which they interpret in their own way taking into account the local social and religious context. Pivotal to this rural context is the worship of Draupadi, the common wife of the five Pandavas, as a heroic village Goddess. 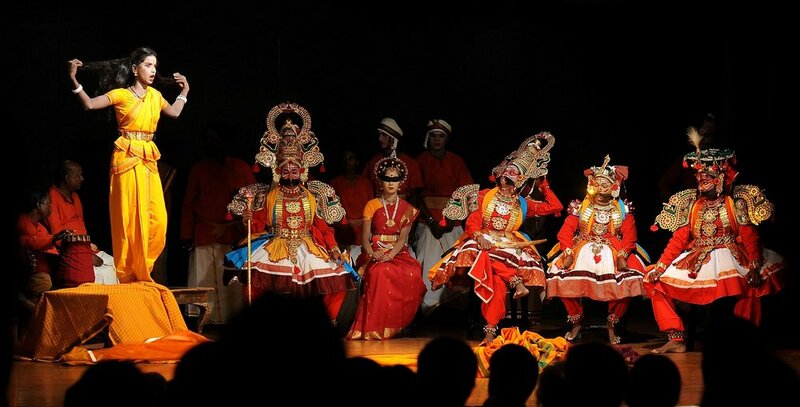 The interconnectedness of the Mahabharata and the centrality of Draupadi-the-Goddess provide Kattaikkuttu performances with additional resonances and philosophical values that help rural audiences make sense of the epic and connect it to their own lives. Karna is one of the most fascinating charaters in the Mahabharata. Karna is the first-born son of Kunti and the Sun God, born prior to Kunti’s marriage. Therefore, he is the Pandavas half-brother. Kunti abandons the baby Karna. As fate has it, Karna grows up at the court of the Kauravas. Duryodhana befriends him and he ends up fighting on the Kaurava side against the Pandavas in the devastating war. Karna is killed by the Pandava Arjuna who is unaware of the fact that he is his half-brother. The tragedy of Karna’s life and death on the battlefield are the theme of an all-night play, Karna Moksham. It is often performed on the occasion of the death of a real person to help the soul of the deceased attain moksha or a liberation of the cycle of rebirths, just like Karna in the play.